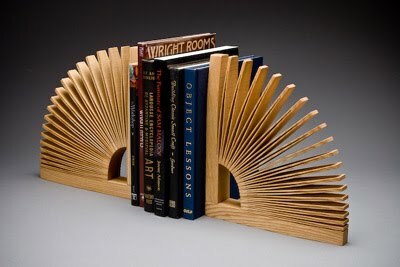 Albanico Bookend by Seth Rolland. These bookends, capturing the leaves of a book in flip motion, are carved by furniture designer Seth Rolland from - amazingly - a single piece of wood. "For many years now I have been experimenting with the dramatic, fluid and graceful forms that can be created by cutting one piece of wood most, but not all the way through and then expanding it. This method has led to clean, honest forms where the structure is the ornamentation. As you can see from the photo above, it is still one piece of wood. 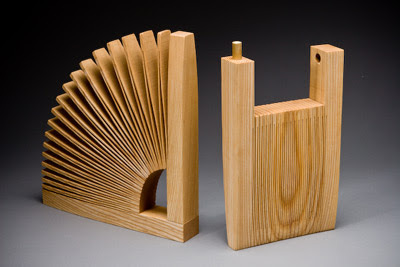 Open it like an accordion and simply connect it to make a useful, strong, sculptural bookend. You can order them from me or get them at the Bellevue Art Museum in Washington, the Museum of Arts and Design in New York, the Art Institute of Chicago, the Santa Barbara Museum of Art, the San Francisco Museum of Craft + Design, or The Gallery on Bainbridge Island" (Seth Rolland). They are made from sustainably harvested ash, are 11” x 2” x 11” high, feature a non-toxic, oil-based finish, and are $120 each, $240 per pair. They are very nice indeed, but they take up too much room! I can see myself putting them in a drawer after my library inevitably expanded.